Sunday afternoon the Miami Dolphins take the field against the Denver Broncos in the most important game of the 2014 season. At this point in the NFL season every game is the most important game. Each game sets up the next as teams jockey for playoff position. This particular game sets up a faceoff with the New England Patriots on December 14th. Win this game and the Patriots game could be for the AFC East title, it could also be for the best record in the AFC. Lose, lose and it may be time to fight and claw for a wildcard berth. The advantage heading into the game with the Broncos is simple: Everyone expects the Dolphins to lose. All over social media, across the television dial, pretty much all the national media has already given the win to Denver. This does not come from some matchup advantage or even some deficiency on the Dolphins part. No apparently Denver will win because they are Denver and oh yeah because “Peyton Manning”. Fortunately for the Dolphins the games are played on the field. On the field Miami has a chance, actually they have a really good chance. Denver is beat up. Tight end Julius Thomas and wide receiver Emmanuel Sanders are recovering from injuries, while their offensive line is just bad. Coming to town are the Dolphins with the 2nd ranked defense in the NFL. The pass rush led by Cameron Wake and his 8.5 sacks will try to harass Peyton Manning throughout the game. Getting pressure on Manning is the only sure way to disrupt the hall-of-fame quarterback and Denver’s potent offense. 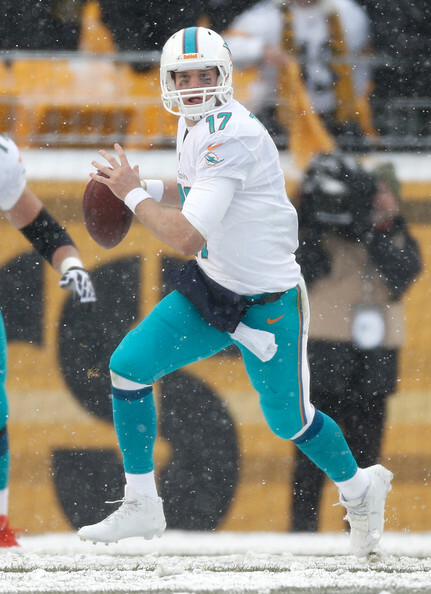 On the other side Dolphins quarterback Ryan Tannehill is on a hot streak. Since the game against the Oakland Raiders in London, Tannehill has posted four games with over a 100-quarterback rating. This brings his rating up to 92.2 for the season, a nice improvement over last season 81.7. It seems as if offensive coordinator Bill Lazor’s offense is finally clicking, with the rest of the offense pulling their weight as well. For the first time in far too long it seems as if the Dolphins are playing as a complete team. The timing could not be better. No game against Peyton Manning is every easy. This week however the Dolphins can walk onto his field with no fear. Previous Post Hit the Road Jack.